All the 1950’s signs of democracy, prosperity, popular culture, and success are in The Americans – the flags, cars, jukeboxes, cowboys, teenagers on dates, motorcycles, television sets, political conventions, movie and television actresses. Seen in “real life,” however, through the lens of Frank’s Leica, without the flattering techniques and selectivity of the picture magazines, these icons of the American national identity all seem disappointing or debased. Cowboys in the mass media during the 1950’s, for example, were still rugged, masterful young men whether they were performing in Hollywood movies, posing at rodeos for Life, or working on ranches for Look’s photographers. 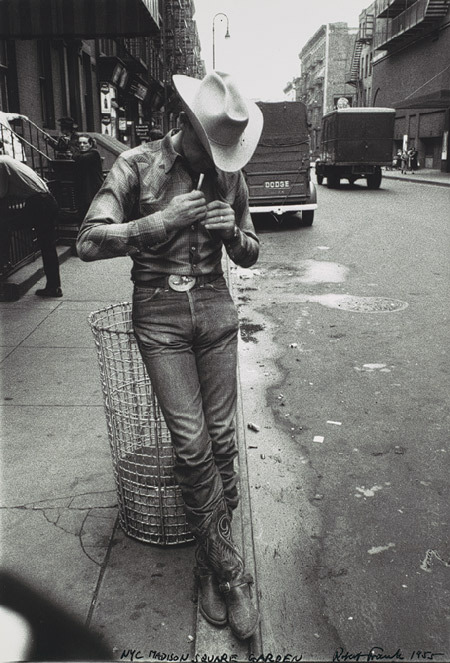 In The Americans, however, one cowboy stands by himself, a lonely figure under a glaring fluorescent light in a bar in Gallup, New Mexico; a rodeo cowboy leans against a trash can on a littered street in New York City; and another rodeo cowboy, seen relatively close up in Detroit, turns out to be an unattractive young man with a bad complexion, who is smoking an ugly cigar. 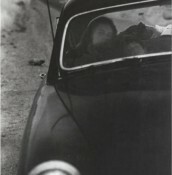 Frank’s images of automobiles were similarly disrespectful. During the 1950’s, the nation’s well-known “love affair with the automobile” reached orgiastic proportions. Earlier, during the depression and World War II, many Americans were unable to buy cars because they were too poor or because production was severely rationed. During the 1950’s, though, some people could buy all the new cars they wanted, and the automobile companies responded with extravagant public relations and advertising stories. “The Great American Automobile… epitomizes the Great American Dream,” Look told its readers in 1957; “more than any other material possession [it] sets you and the American way of life apart from all the world’s peoples. To their wondering, hungering eyes, your automobile is the symbol of your power, the proof of your prosperity.” Also symbolic were the annual General Motors “Motorama” exhibits – photographed in 1953 by Dennis Stock for Magnum – in which bands of awed consumers stared worshipfully at floodlit, futuristic “dream cars” like pilgrims visiting a shrine or cathedral. The 1950 Ford Business Coupe Frank used on his Guggenheim tour did not fit this iconic stereotype very well – it was already five years old when he bought it – and neither do his pictures of automobiles in The Americans. Throughout the book, he showed automobiles associated with people and scenes that would never have been allowed to appear anywhere near the “new models” in advertisements and pictures magazines. In this image of the General Motors “Motorama” exhibit, he photographed three rich children sitting in one of the model cars, their faces already hardened by precocious boredom and arrogance. 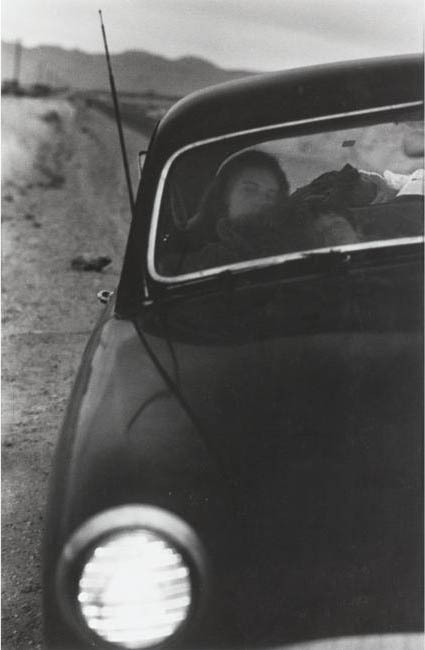 In Butte, Montana, he photographed a slovenly, middle-aged woman in her car with a sullen child staring out of the window behind her. He showed a bench full of decrepit old people in St. Petersburg, Florida, staring at nothing in particular while a shiny new Pontiac whizzed by on the street behind them. In a public park in Ann Arbor, Michigan, he made a wonderful parody of a pastoral love scene when he photographed teenagers in bathing suits necking and petting in the grass by a parking lot, surrounded by Packards and Buicks glistening in the same afternoon sun that makes the park’s trees seem hazy and romantic in the background. Frank also used sequences in The Americans to make some very unpleasant connections between automobiles and other realities. 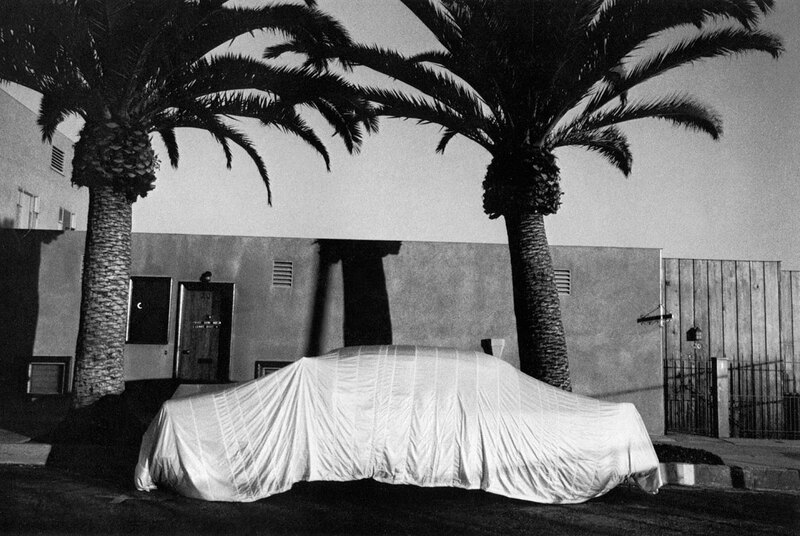 The St. Petersburg picture of the old people on the bench, for example, is immediately followed by a picture of a “Covered Car – Long Beach, California.” Following the picture of the old people and the Pontiac, the image of the mysterious, shrouded car suggests that the old people and the Pontiac, the image of the mysterious, shrouded car suggests that the old people are about to die. 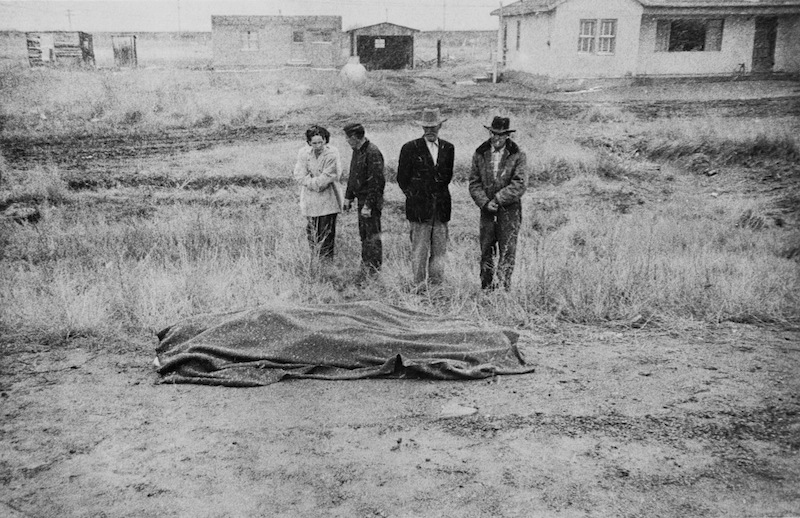 Then to complete the connection between cars and death, Frank followed the Long Beach picture with one showing the results of a “Car Accident – U.S. 66, between Winslow and Flagstaff, Arizona”: three men and a woman stand over two corpses shrouded by a blanket or tarpaulin, lying on the shoulder of the road. In the background, a weedy, barren field, a drab ranch-style house, and a few flimsy outbuildings are a bleak vision of death in a wasteland, witnessed by strangers and a passing photographer, as any image in a modern poem, film or novel. 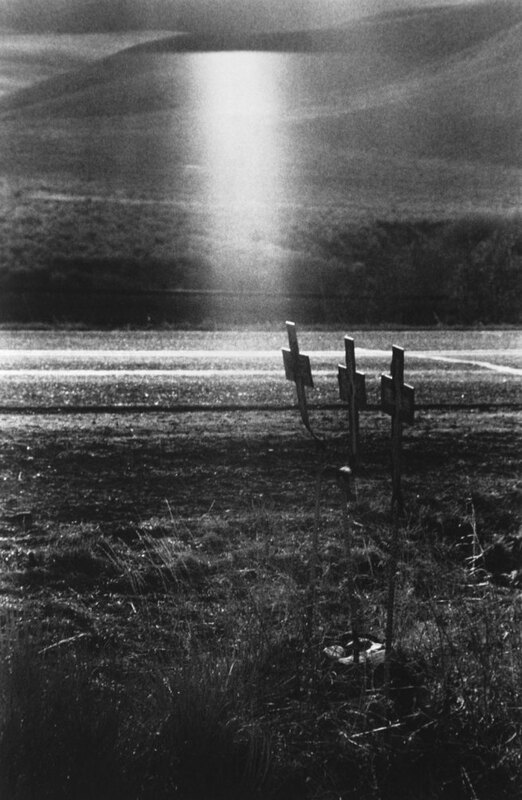 Another accident scene, marked by three crosses beside “U.S. 91, Idaho,” is followed by a picture of Detroit autoworkers on a Ford assembly line. Instead of the immaculate, orderly assembly lines in the USIA brochures and the picture magazines, Frank’s is real – blurred, hectic, crowded and grimy. And, since it immediately follows the image of the three crosses, the sequence implies that the workers are dying as they manufacture cars that kill people. YOU MIGHT ALSO LIKE: ASX.TV: Enrique Villaseñor - "Cuba y Mexico"
Posted in Essays, Masters and tagged American Culture, Archive Highlights, Automobile, Black and White Photogrpahy, Death, Documentary Photography, Essay R, Robert Frank, Social Critique.